Last year, it was lemon and strawberries; this time, vanilla and passion fruit take the stage to celebrate my sister’s birthday. I don’t bake layer cakes as often as I would like to, but when I do this is the first book I reach for – again, the results were great. The cake layers turned out tender and the ganache was delicious and light, yet easy to spread and firm enough to hold the cake together (I adapted a white chocolate ganache recipe from the book). Prepare the ganache: put the white chocolate in a small heatproof bowl. In a small saucepan, bring 1/3 cup (80ml) of the cream to a boil. Pour the hot cream over the chocolate, let stand for 1 minute then whisk until smooth. Let stand until cool to room temperature. Process the passion fruit pulp in a food processor or blender to crack the seeds. Pass through a fine sieve directly onto the white chocolate mixture and mix well (I left a bit of seeds in the ganache just to make the cake look more like a passion fruit). In a chilled bowl, with chilled beaters, beat the remaining 1 ½ cups of cream (360ml) with the sugar until softly whipped. Stir in the passion fruit cream and beat until fairly stiff, taking care not to overbeat the mixture, which would cause the ganache to separate. To assemble the cake, place one layer, flat side up, on a cake stand or serving plate. Spread about ½ cup of the whipped ganache over the layer right to the edge. Repeat with the next layer. Plate the last layer on top and use the remaining ganache to frost the top and sides of the cake. I love passion fruit. What a great addition to the cake! I love that cook book!!! yum! what a pristine and pure and completely perfect cake! i love the look of it and i love the flavors involved--bravo! wow what a fantastic cake! this looks so tender and yummy. Passion Fruit Ganache??? I love you. I'm going to have to order that book. I hear so many good things about it! Um, this is GORGEOUS! Love the soft colors--any sister would be thrilled to have this. It looks so light and delicate! Oh look at the vanilla beans just pop out of that frosting. Swoon. This cake! Wow! I can't get over how beautiful it is. It's gorrrrgeous. Stunning. It looks so fluffy. That looks SO lovely - a real triumph considering pale cakes can look rather uninteresting! I just love layer cakes and get so much enjoyment from making them - especially for birthdays. I really love the sound of that baking book. This cake looks so amazing! wow I just posted about a layer cake for a birthday too! Love your cake sounds really yummy! That has to be one of the most gorgeous layer cakes I've ever seen. And in two of my favorite flavors, vanilla and passionfruit. Lovely, Patricia! And thanks for your kind words! Lovely, lovely cake. The flecks in the ganache are so pretty! very pretty! so simple, but stunning! I definitely want to buy that book ! Your cake is gorgeous and looks so yummy ! I love how white and fluffy this cake looks! And the frosting on the outside yummmm I want to stick my finger in it. Looks perfect. Whipped passion fruit ganache sounds delicious. Symphonious Sweets, that cookbook is amazing! Grace, thank you for visiting! Anh, I hope he likes it, sweetie! A Bowl of Mush, thank you for stopping by! Pea, those are passion fruit seeds, darling! Thank you - that book is amazing! Mari, thank you for sharing the good news with us, darling! Maybe, I'm sure you'll love that book! Thank you! La Cuina Vermella, tks for stopping by! Grazie! Wow your cake is stunning and the passionfruit ganache sounds divine! Ever since I first tasted passion fruit (it was in France, in a sorbet) I have been madly in love with the fruit and flavor. 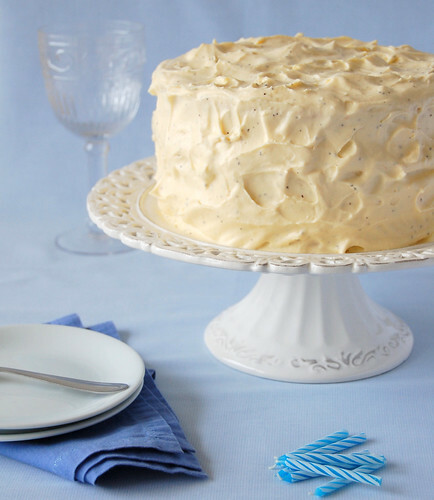 This cake looks fantastic and the passion fruit in the frosting is a winner. What a great cake ! I bought Sky high too and I love this book ! I'm searching for a recipe to make this weekend and maybe I'll try your ganache ! Thanks ! I am having so much fun with your site! Lots of showstoppers! Love it and your creativity! Megan, you are far too kind, sweetie! Thank you! This cake stuck to the pan every time I tried it. Caused me to have a meltdown in the kitchen. Not a good idea especially when doing it as a cake for a big party. Now i have nothing to bring because I trusted it would work as promised. 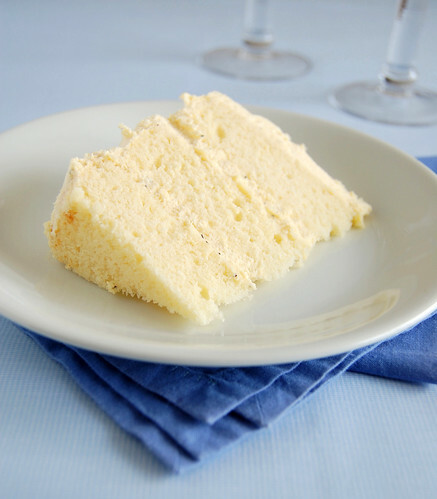 I plan on making the vanilla buttermilk cake but with a different frosting for my birthday. First off, was the cake moist when you made it? Would it be ok refrigerated or should it be left out in room temperature? Thanks in advance! Hey, Jennifer - the cake was tender and it got moist from the contact with the frosting. Ganache holds up well out of the fridge in cold days, otherwise it would melt. I am amazed by this cake. I can't wait to try it and I'm sure many of my people too!